Greetings! I've been collecting high-end line scan lenses over the past few years and am wondering who else could contribute first hand experience with these lenses. It would seem all innovation in optics is coming from this market sector. It's nearly impossible to find any recent manufacture high-quality industrial optics outside of line-scan systems. Considering its now marketed for line scan cameras I also include the printing-nikkors in this category. I have the 50mm Schneider Xenon-Saphire and the 95mm Printing-Nikkor. I think my Rodenstock 108mm LFOV is in the line scan category as well. The inspection market does indeed seem to be the driving force for industrial optics. What are you plans for comparing lenses? I'm typically testing a new lens against a known lens (whatever I've evaluated to be my current "best" lens at a comparable resolution) and seeing if it performs better or worse. If it performs better or has qualities I like I keep it. If it doesn't I re-sell it. Once I determine a lens has good resolution and decent coverage for medium format digital it becomes a much more subjective process. The specs I need for a lens are a ~60mm Image Circle and 5um resolution. The only lenses that really perform well with my system are line scan lens and large format digital lens. After traditional albeit subjective resolution and contrast evaluations I'm looking at more subjective qualities of a lens. One thing I've been exploring lately is sharpness fall-off outside of a lenses intended magnification. For example: i've been experimenting with lenses that quickly fall off outside their intended magnification (ie. the 105 PN) or lenses where I can choose which magnification will be optimized (85 MVN). What I'm interested in cultivating in the macro world is having control of the resolution fall off as you get further away from a desired "focus" area in the image- to mimic the traditional photographic effects of a landscape photo where there is some effects from a limited DOF happening. This applies mostly to the landscape work I have been experimenting with lately where I am looking for ways to make the images appear more natural. The resolution fall off is also amplified by shooting "by sensor" not by rail or helicoid as you have magnification changes the deeper the stack goes. I almost always shoot by moving the sensor unless I have a flat subject or I don't intend to shoot a deep stack. Things I'm trying to avoid are chromatic aberration and other forms of optical aberrations. I did some digging and while the seller of the lens wasn't sure which model the lens he was selling I was able to determine the model from dimensional specs provided by the manufacturer and it does appear to be a 0.7X/1.4X model. I need to make better adapters for the Xenon-Saphire and the Myutron to make more definitive tests. I'm still waiting on the Xenon-Saphire to arrive anyways. If anyone is interested in images from the Myutron or Xenon-Saphire I can post some images in the next week or so. The Schneider Xenon-Shapphire specs look really really good! I found a used non-Ebay lens so can I ask about yours. How do you mount it? To use is in reverse do you use a V-mount adapter on the front or just the filter threads? Schneider makes a threaded body Xenon-sapphire made to use normal or in reverse thats why I am curious. The Schneider Xenon-Diamonds are supposed to be rated down to 1.5 microns resolution and are marketed as being Inspec.x beaters. Schneider doesn't list a 50mm Xenon-Sapphire Ray, I know only because I was just looking this weekend. I wonder what you have? Schneider lists the X-S by magnification and those turn out to be 95, 96, 97, 98 and 88mm in FL. At least that is what they offer at the present time. There are lots of other Xenons out there though. I remember a batch of industrial Xenons on Ebay a while back. The X-S are really high end optically, made for 3.5 micron sensors with a big image circle. I'm machining M72 threads in a recessed Rollei/Novoflex lens board to use Myutron and Sapphire on my bellows system. The Myutron is easy as it has threads on both sides of the lens. I'll give the Sapphire a shot reversed but I'm not overly optimistic that it will be stellar at 3.4X. The front threads of the Sapphire are M52 so I'll need to make a M52 to M72 adapter (or find a combination of step up rings that work) would be easy to reverse it with a Nikon BR2A lens reversing adapter for a Nikon DSLR. 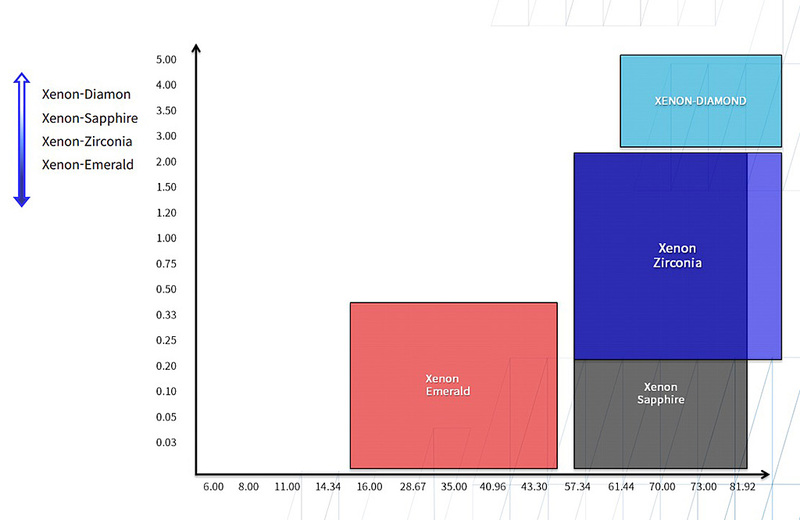 Of the larger format Xenon lenses the Xenon-Saphires and Xenon-Diamonds appear to be the top of line lenses that Schneider offers (in conjunction with the MacroVaron) The series covers a continuous spectrum from 0.07X to 2X for Sapphires and 2.5X & 3.5X for Diamonds. Only the Sapphires appear to resolve to 3.5um the Diamonds are quoted at 5um. 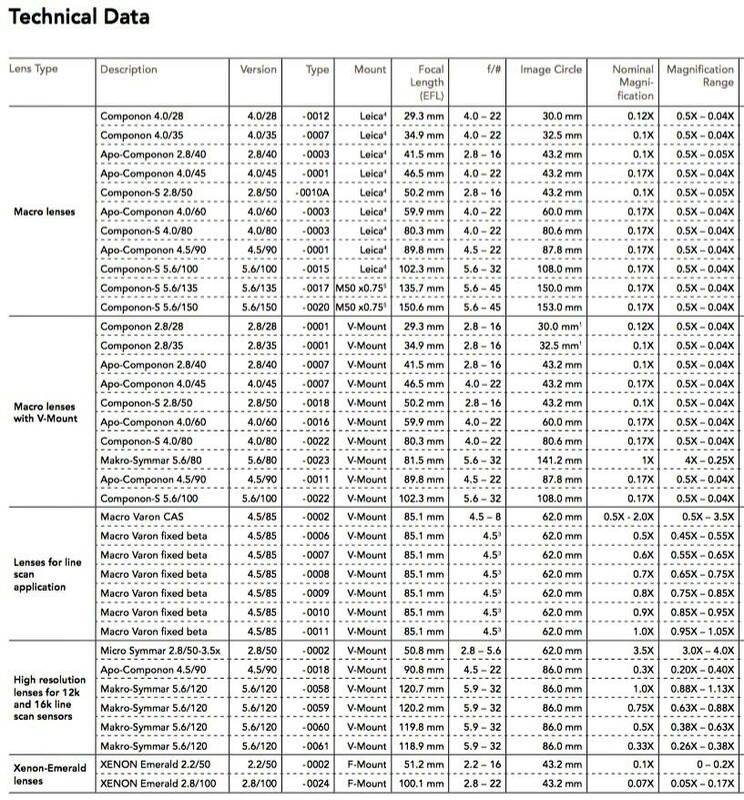 I think Schneider is playing at the Linos game by quoting object side resolution (1.5 - 2um) not image side for Diamonds- the MTF curves on the Diamonds only go to 72lp/mm while the Sapphire's (below the 2X) have curves for 100lpm in the MTF charts and quote 3.5um compatibility on their spec sheets. Not to diminish the flat line MTF charts on the Diamonds, they look incredible. The lower mag lenses are obviously at an advantage in terms of resolution given the laws of diffraction. The Xenon-Zirconias appear to be more of a macro line extending from the Xenon-Emeralds- both the Zirconias and Emeralds appear to have slightly lower resolution than the Sapphires and Diamonds. However the Zirconias have some pretty attractive flat line MTF curves so I'm intrigued- they also come in more standardized magnifications. If you compare the 2X Sapphire to the 2X Zirconia the Sapphire shows more contrast at 72lp/mm than the Zirconia shows at 50lp/mm. I think Ray has a Xenon-Emerald - that product line is F-mount and includes a 28,50,60,80 and 100. Really nice looking lenses but look to be optimized for magnifications closer to infinity and larger pixel sizes. I remember your test results of the LFOV where pretty incredible - what's your summary of this lens? Do you use it often? I have a LFOV with extreme haze in the inner coatings- unfortunately it seems the supply of LFOV's in Israel have dried up. I'm keeping an eye to see if they pop up again. Same goes for the S-2 and S-3 lenses- I don't see those coming up very often any more... I doubt they made many of these lenses. Has anyone experimented with stopping down the S-2's? I figured out if you loosen a set-scew on the front of the lens you can adjust the aperture. I have 1ea of all the S-2's. I just picked up a mysterious 150mm Linos lens from Israel- It appears to have similar construction techniques to the top of line Rodenstock Digaron lenses so I'm hoping it has comparable performance- it's a beautiful lens at the least. It sat on eBay for a while and I finally picked it up with a low offer. My go-to lens for coins has shifted over time from the 75ARD1 to the 108LFOV and is now moving to the 85MV. Until I got the 85MV I was a Rodenstock guy and had a fairly low regard for Schneider lenses, but the 85MV has changed that. That said, I still have very high regard for the 108LFOV, as it won my last shootout of ~100mm lenses. The decision to go with the 85MV will be more based on its more reasonable working distance than on its image quality. The 108LFOV image quality is superb, though I have only tested on APS-C. Some Rodenstock Scitex lenses were part of my last shootout and did very well (3rd, 4th, 5th places). Second place went to a Kyocera/Tomioka E36C lens, so that might be another place for you to look as well in your comparisons. This screen grab from a Schneider PDF (asian distributor actually) makes it easy to see coverage and magnification at a glance but I wish they would show one with pixel resolution. The X-S and X-Z are awesome, that kind image quality over that large of an image circle, amazing! 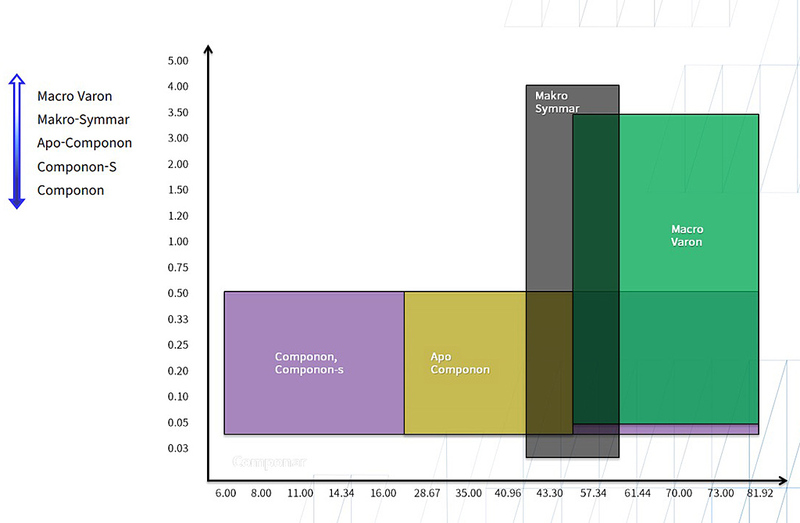 You can almost miss on the 2nd image that the Componon and Componon-S have full range of coverage. The purple box extends all the way to the right side of the graph just peeking out. Odd how they rate these. Maybe a dumb question, but why would coverage have a lower limit? You are right Ray, I didnt even notice that. Looks like the bottom mag range is the edge of the recommended range for the lenses. From what I understand - the reason for the floor in coverage has to do with image circle- lenses optimized for less than ~0.1-0.3X are going to have an easier time going to infiniti so the floor there is less of an issue. It's when you optimize for higher magnifications that you see a dramatic falloff as you decrease magnification. For instance, ignoring the sharpness/contrast falloff for a moment, the 105mm Printing Nikkor with a ~60mm IC will suffer from horrible optical aberrations like astigmatism as you approach infinity, especially at the corners on larger sensors producing unnacceptable results outside of its intended range. It's the reason I keep my 120mm SK Macro Apo-Digitars around for deep stacks - they have a 110mm image circle at 1X and are quoted by SK at a 80mm IC by 0.25X. These lenses are known to produce acceptable results at infinity on larger sensors. A pretty dramatic difference for two lenses that are both optimized for 1X. It will be interesting to see if the 0.29X Xenon-Saphire produces acceptable results as it approaches infinity or if there is a dramatic falloff. Also due to its extreme resolution it will be interesting to see how it performs beyond 0.29X or if the quality decreases rapidly outside of its optimized range like the 105 PN. I'm tempted to send the Xenon-Saphire to coinimaging for an empirical test- @Ray do you think he would be interested? So the lower range of image circle corresponds to the lowest magnification limit? Makes some sense. Wish I had one to test. Looks like something for the want list.